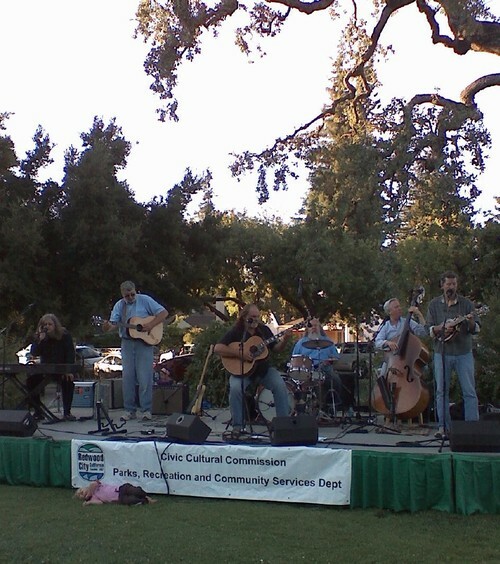 I stumbled upon this wonderful gem of a band playing at a summer concert series in, of all places, my local neighborhood park, sponsored by my hometown's Civic Cultural Commission. (I love this town!) I had read the description of the band playing tonight, "Houston Jones," describing their music as "high octane Americana" -- playing a mix of everything from electric blues to bluegrass, with a little gospel, folk, rock and country thrown in. It sounded like fun, so my youngest son (8 1/2) and I changed into our tie-dye shirts, drove through McDonald's for a Happy Meal (and a Caesar salad for Mom), and headed to the park. I love these outdoor summer concerts ... LOTS of cute kids running around and dancing, families picnicking, the opportunity to run into friends, neighbors (and even relatives! -- I ran into my nephew and his wife), dogs of every shape, size and color ... and tonight we were treated to some truly EXCEPTIONAL music. After a couple of songs I said "Whoa!" ... realizing this was a group I should write a review on. Luckily I had along my Mobilebeat LG phone -- I never leave home without it! When I read the band's Bio at their CD table I understood why I was so impressed with their music ... these are some very talented musicians who have "been around." (And I mean that in the good way!) 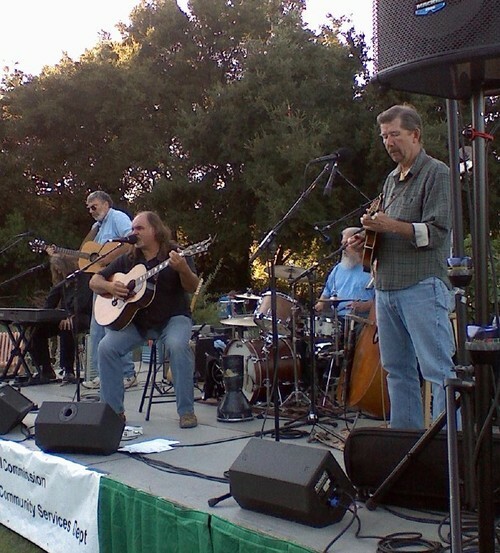 Four of the band members were original members of the very popular band "The Waybacks;" lead guitarist Glenn "Houston" Pomianek, who can apparently do it all, has played with blues legends, T-Bone Walker, Albert King, BB King, as well as country music royalty, Hank Williams Jr., Merle Haggard, Waylon Jennings, Willie Nelson, Emmylou Harris, the David Grisman Quintet, Ricky Skaggs, and the Nitty Gritty Dirt Band. OK, I'm impressed ... and am patting myself on the back at the same time for quickly recognizing that these guys weren't just "some local band." Travis Jones, with the great voice (lead vocals & rhythm guitar), is also a former member of The Waybacks -- he's played with Billy Ray Cyrus and the Doobie Brothers, among others, and he played the "critically acclaimed" starring role of Hank Williams in a musical production about the country music legend's life. Travis has also composed an original musical score for a stage production. The core members of Houston Jones are the aforementioned Glenn Pomianek and Travis Jones, and Peter Tucker (Percussion), who was a member of the 60's band, the "Beau Brummels" and has also played with notable musicians such as Richie Havens, Warren Zevon and Skunk Baxter. Chris Kee (Bass) is a classically-trained cellist who was previously a member of the "Ten Gallon Cats" and "The Waybacks." Chris has performed and recorded with an impressive list of artists such as Peter Rowan and Norah Jones, and over the course of his musical career, has opened for the likes of Jerry Garcia, Lyle Lovett, Los Lobos, Bela Fleck and J.J. Cale. And this was at a free concert-in-the-park!! 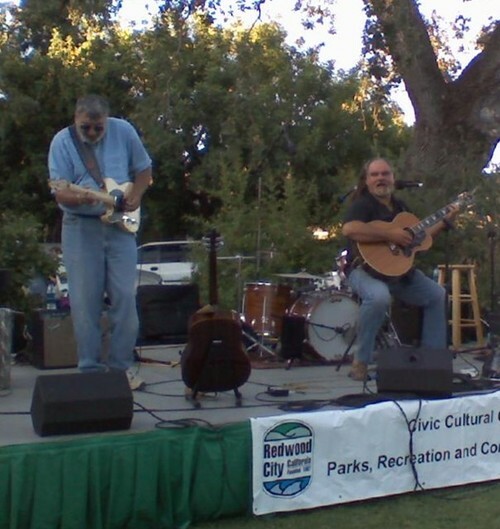 Thank you, Redwood City Civic Cultural Commission and "Houston Jones" for such a quality concert and such a wonderful evening! Check out Houston Jones' schedule at their website: www.houstonjones.com, and go see them if they're going to be playing anywhere near you. And if they're not, order one of their CDs. These guys are a rare treat!! You got me curious, I needed to know what "high octane Americana" sounded like. While the band has a lot of upcoming dates over the next few months, none of the events are near me. So... I checked out their website and listened to a few of their sample tracks. I think I'll get one of their CD's too. Thanks for the introduction to Houston Jones! i say this over and over again, but a phone took those pictures??? ?